In the field of fundamental superconductivity and magnetism research one of the key objectives is to link the emergent electrical properties of a condensed matter system to its crystal structure. Previously, the only way to continuously tune the structural properties, such as interatomic spacing, was to either apply hydrostatic pressure in a pressure cell, which exerts an influence on all the crystal axes,or by attaching samples directly to piezoelectric materials, which is only capable of a small range of strains, and these strains vary with temperature. 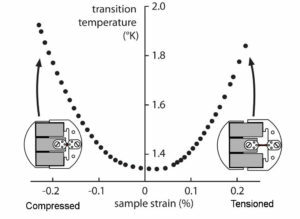 If only constant (rather than continuously tunable) strains are required, the sample can be strained manually between clamps before cool-down, though again, differential thermal expansions would mean that the final strain experienced would be difficult to calculate. One final way of changing the interatomic spacing is by changing the chemical composition of the crystal, which can introduce unknown chemical effects of the crystal, as well as influencing all the crystal axes in a difficult to predict way. The Razorbill Strain Tuner offers a substantial improvement on these techniques and offers a unique opportunity to test theories linking structure to properties by offering the chance to apply continuously tunable, temperature compensated uniaxial strains along a single crystal orientation. An early version of the device has already been instrumental in a 2014 publication in the journal Science, and similar such devices have the potential to become a standard technique in the condensed matter physicists arsenal for understanding novel systems. Our entire product range will fit vertically inside a 1-inch magnet bore and will apply extensions or compressions at cryogenic temperature of up to 10 um to a sub-millimetre sized sample. They has a built-in capacitive position sensor to allow the magnitude of these strains to be determined and, critically, have piezoelectric stacks arranged so that their significant thermal expansions upon cool-down substantially cancel each other out meaning that no strains are inadvertently applied to the sample as the temperature is changed.